From the images we’ve been seeing all day of the Notre Dame Cathedral, you’d think the cathedral portion would be nearly unrecognizable. But that’s not even remotely the case. 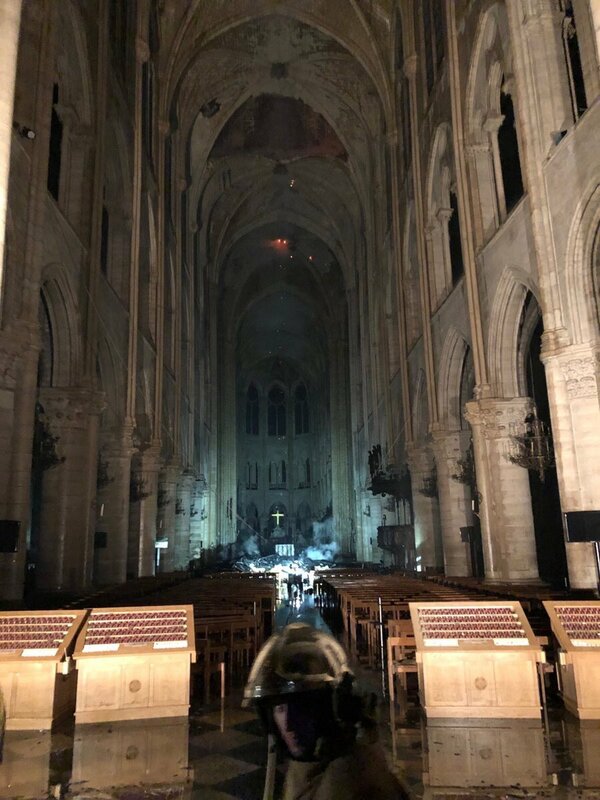 Here are a few photos that show the interior of the cathedral after the fire. Pretty amazing! I must say I was expecting a lot worse. The roof is still a big concern though, as it could collapse at any point. But it looks like there’s still a lot to work with. I’ve heard reports that many of the holy relics have been saved as well. It will be interesting to see how the media eventually spins this, if it is found that some people did something. They will be squirming. But I hope the truth will leak out some how. @Zombie Even when a jihadi shouts “Allahu akhbar!” while committing some unspeakable act, they struggle to find a motive. Europe seems pretty much God-less in it’s current state. Do you all think this fire happened by accident? Something tells me that “some people” did this on purpose. No, I certainly wouldn’t proclaim that without a full investigation. All possibilities should be on the table. Considering this is a priceless icon of western civilization and the timing and other suspicious circumstances, arson cannot be ruled out. It is odd they immediately concluded it was an accident, unless someone has confessed to accidentally starting it. Sounds like they don’t want to find out the truth. This attitude is leading them to their own destruction. Thanks for that Doc. I found the last two paragraphs said what needs to be said, long and loud and often. You’re welcome, Kenoshamarge. He’s not the first one to mention that the great cathedrals of Europe have become more tourist attractions than houses of worship. Add St. Patrick’s Cathedral in New York to that list. It’s referred to as a “landmark” not as a house of worship. Glad to see the interior in such great shape! I couldn’t believe the fire was as bad as it was. I thought the roof was slate and of course the walls and buttresses stone. When my husband first told me it was burning I couldn’t believe it. Happy to hear much of the artwork was saved as well! I’m not religious but this truly saddened me because it is such a beautiful work of art. I imagine the blood, sweat, and tears that went into building it. I hated to think of all that beauty, craftsmanship, and history lost to the flames. Notre Dame was a testament to the greatness of God but also a testament to the greatness of mankind. At Jihad Watch, Spencer is reporting that the fire started in two different areas and the roof has collapsed. You know, earlier in the other thread I pointed out that a small joy we can take from this is that the statues around the spire had been taken down (and shipped to safety) just days earlier for restoration. I didn’t put 2+2 together at the time (probably the jaw-dropping, soul-crushing sadness of the event), but I was reminded reading the news on the subject that those were the statues of the twelve apostles and the four evangelists. That plus the altar and cross. I mean, wow. Talk about the Big Guy mitigating. Easter – triumph over death. Its eternal story. Its eternal promise. 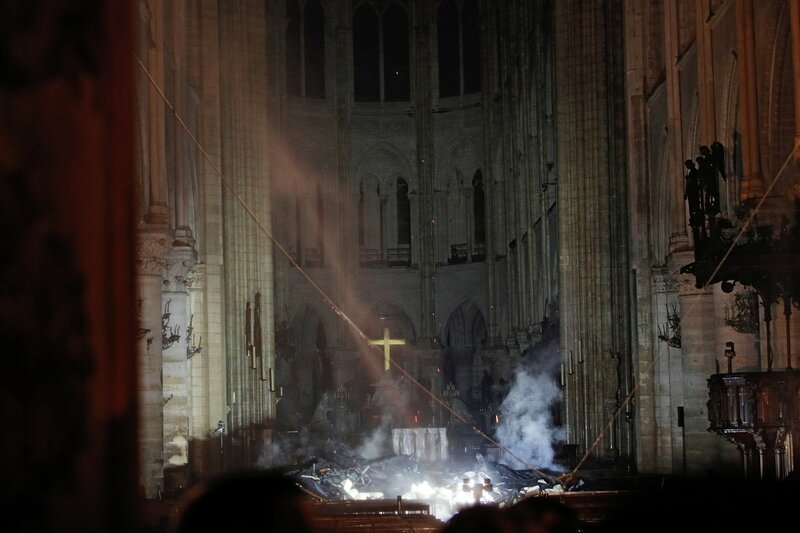 The cross in the middle of the rubble, absolutely STUNNING! These photos have lifted my spirits considerably, thanks for posting, Scoop! Amazing there wasn’t more damage. Then again maybe not that amazing. The first thing I noticed was the gold cross still shining brightly. To God be the glory. There was huge damage. Walls remain precarious. They probably will not even be able to enter the area where the fire started, leaving it all to mystery and speculation. Amazing though what wasn’t damaged. I heard there was relic of a crown of thorns! So it is attributed to Jesus and wasn’t destroyed! Alleluia…right here before the time he would have worn that crown and been crucified! It’s eerie but I feel like we are suppose to be learning something here folks!!!!!!!!!!!!!! The fire brigade chaplain rushed into the fire and saved it!!! This is the reason they didn’t build them out of wood. Some are saying it was deliberately set though at the moment it’s just hearsay. It is giving me hope to see these pictures! 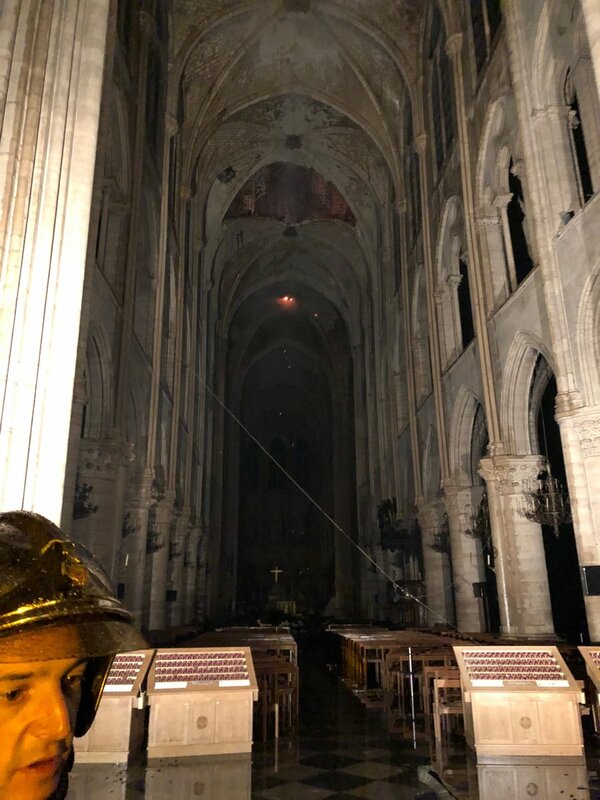 It is still hard to understand how this could happen to a national treasure and an iconic Catholic world wide treasure…..I feel like God had a protective hand on Notre Dame and we need to learn something from this! The roof concern is the big thing. But what’s interesting is that it looks like it did exactly what it would have had the fire happened 500 years ago. The architecture was designed with fire prevention/control in mind, but if it’s as damaged as much as I fear then it’ll take the whole structure down with it. I hope they have things contained enough that they can start shoring up the weak points. I believe the flying buttresses hold up the vaults. It seems a couple parts of the vaults did fall though. I used to live in a house that was built in the 1930’s…..never had a problem with that house. It was so well built…some today would say overkill….today houses are shoddy! Imagine two centuries to build a cathedral 800 yrs ago…..maybe overkill a thousand times over! Macron stated. The problem is they want to rebuild the building for the tourists as it is a huge draw, they don’t want to rebuild The Church in France. KWIM? 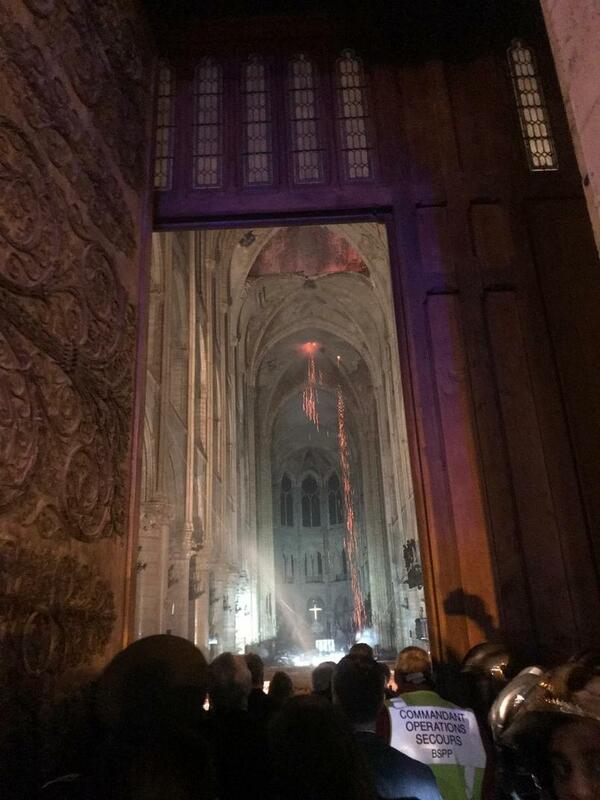 I believe it….France has proven they are liberal progressive…they can’t take the history or what Notre Dame means to Catholics away! I hope most of the history has not been taken by this fire! I’ve been there. There is a lot of stone. Thankfully that doesn’t burn. Beautiful place. I hope they will rebuild it exactly the way it was . Maybe the cathedral is salvageable after all. The only question is whether there is the desire to restore it. Why restore when they will burn it again? The prosecutors’ office have already ruled out arson, including possible terror-related motives for starting the blaze. Methinks a little too quickly. Also, does anyone have an idea why the smoke was first orange, then green, then black? I thought the same thing, two different places? I wonder who hold the insurance policy?? Add me as another who is wondering how a fire could start in two different places. Look at that! The cross survived! Standing for all to see….my eyes went to it in every picture! A sign that God will not be defeated! TomNewman64 That’s the first thing I noticed. There doesn’t look like there’s much to burn inside, it’s mostly stone. Maybe it’s salvageable. Great news. So much misinformation and people getting worked up. Hope to see it later this year, atleast from the outside. I’m glad I attended mass in there before. Not sure when it will be open for mass again. They are saying that they saved it? David Almacy quoted on Fox said it took 20-30 minutes for the fire dept. to get there. Outrageous. He and his family arrived at 6:45 just as the place was closing. At 6:50 he smelled smoke. That’s good. I hope that they can save it and no one is hurt in the process. Wow that is amazing, hoping it can all be restored.